Exercise in the VacuShape proceeds in the form of a brisk walk on a treadmill for a period of 30 minutes. During this time the affected areas are inside the vacuum pod. Thanks to the vacuum there is an increase in blood circulation to the adipose tissue layer and fats are transported from fat cells into the working muscles where they can be burnt. During each session the heart rate is monitored so that you are always exercising in the aerobic band. The sub-atmospheric pressure not only activates the metabolism of fats, but also the lymphatic system, which ensures better removal of metabolic waste products. Stronger blood circulation to the skin and an enriched supply of oxygen, vitamins, minerals and enzymes act positively against orange peel skin. Following regular sessions in the VacuShape the skin is both smoother and softer. * Aerobic band – exercise during which the heart rate of the client is approx. 65 % of the max. 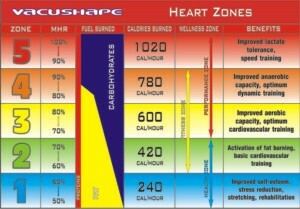 heart rate (MHR). The MHR can be determined using the following simple equation: HR = 220 – age.